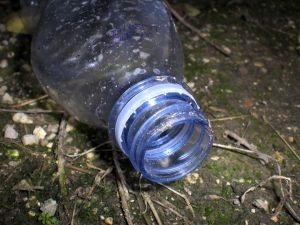 I got involved in a discussion on the Growing a Greener World website yesterday on the movement by Rodale.com for a Plastic-Free February and I wanted to bring information from that chat here for those who may not have seen it. Even before we were aware of this movement, John & I were talking about our desire to get away from plastics by the time we build and move into the new recycled/reclaimed home we are planning. Those talks got me thinking about just how deeply plastic is embedded in our lives even when we don’t realize it. Don’t believe it? Try to get through a single day without buying something that contains plastic or is packaged in plastic. In my case I ask myself how things were done before plastics were in use. Glass and ceramic containers just make sense to me for food storage. The freezer remains a bit of a mystery to me though, I must admit. At the supermarket the first rule to remember is that the simpler the ingredient, the less packaging it should require. Sugar, flour and most baking needs come in recyclable paper-based packages. For vegetables and fruit I plan to make these reusable produce bags from reclaimed sheers. Larger quantities of beans and rice come in canvas bags and they cost less to boot. While John & I aim toward purchasing beef in quantity through a coop that allows me to buy “half a cow”, you can also ask the meat department personnel to package your meat in deli paper the way it used to be done. If you purchase eggs, purchase them in recycled paperboard containers instead of foam. Milk is rarely found in glass these days so the next best thing will be cartons, though many of them these days have plastic spouts and lids. Still, a reduction in the purchase of waste plastic is better than no change at all. At the very least I hope that people can see the tremendous amount of plastic that is wasted on a daily basis and actively seek ways to consume less plastic and send less of it to the landfill.